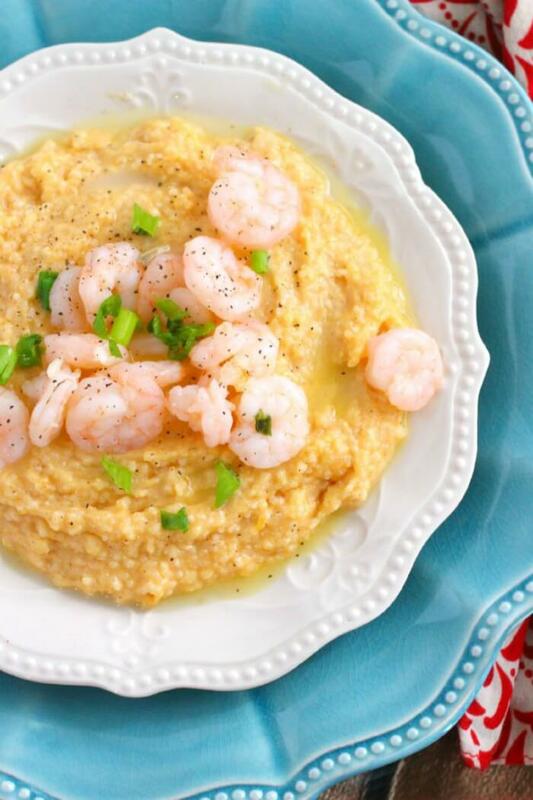 Shrimp and grits are a classic southern comfort food! Shrimp and grits, yay! I feel like most folks who love grits grew up eating them. I however did not. In fact, I had never even tried grits until a year or two ago and only had good grits this past February when we visited New Orleans. I’m not sure what possessed me to give shrimp and grits another go, but I’m glad I did because whooooeeeeee, I fell in looooove. We like to serve our shrimp and grits with roasted okra (it’s NOT slimy! ), sweet cornbread, and pickled green tomatoes. 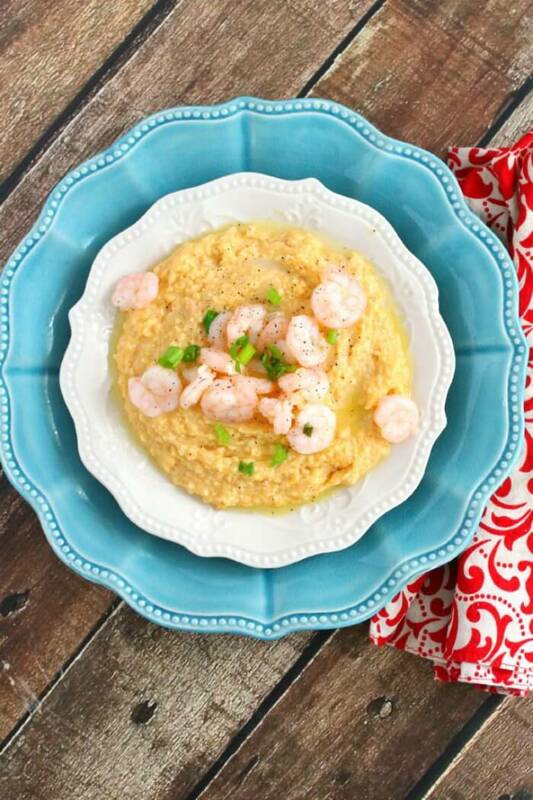 This shrimp and grits recipe was originally sponsored by Campbell’s Soup Company. All recipes and opinions belong to Mama Loves Food. Chicken stock – chicken stock is so important when making savory grits, because the grits soak up all that delicious flavor when they’re cooking. You can make your own chicken stock or purchase it at the market. Grits – I will probably get strung up and beaten with a wet noodle for saying this, but I love five minutes grits. They cook quickly and taste great. Why make more work than necessary? 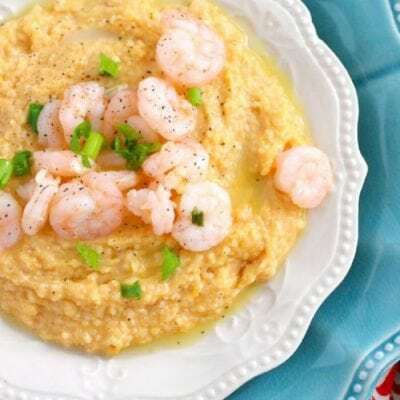 Heavy cream – Heavy cream is what gives this shrimp and grits recipe that deeply satisfying rich flavor. Don’t skimp on the cream. Seasoned salt – Seasoned salt (we like Lawry’s) is a great way to simplify recipes – if you don’t have a seasoned salt you love, salt and pepper will work in a pinch. Cheese – I used a blend of finely shredded cheddar and monterey jack- cheddar alone would still work well though. Shrimp – We start with raw shrimp. Shrimp cooks up quickly, so there’s no need to get the pre-cooked kind. Garlic – Because there’s no such thing as a good southern dish without garlic, amiright? 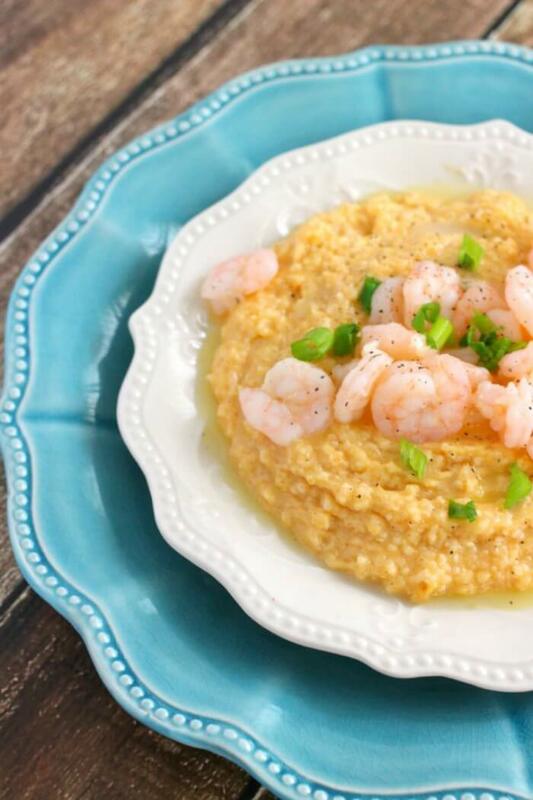 Are shrimp and grits gluten free? Shrimp and grits are totally gluten free. 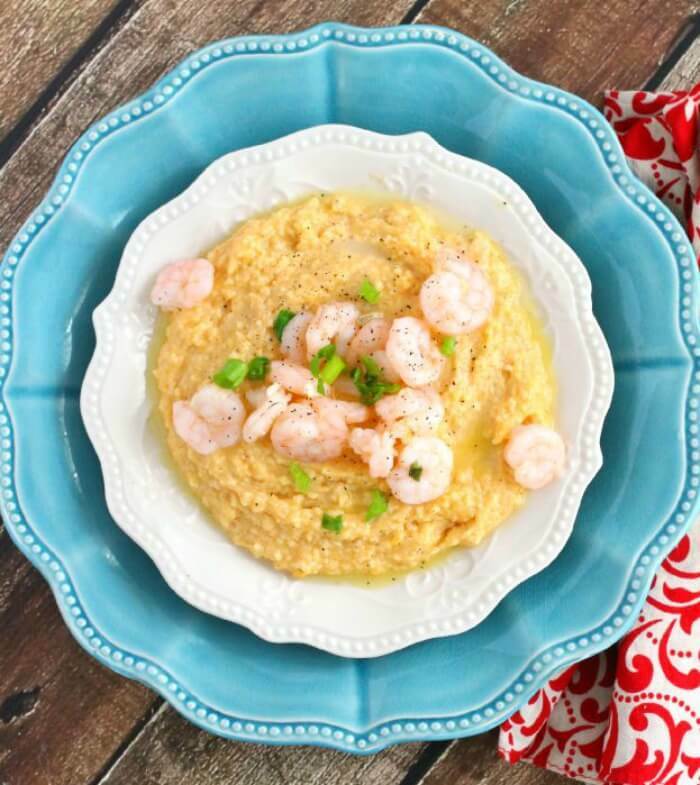 Grits are made of cornmeal (gluten comes from wheat, not corn), and our shrimp recipe does not call for flouring the shrimp. So if you have a gluten allergy or intolerance you’re perfectly able to enjoy these shrimp and grits. What kind of shrimp in shrimp and grits? 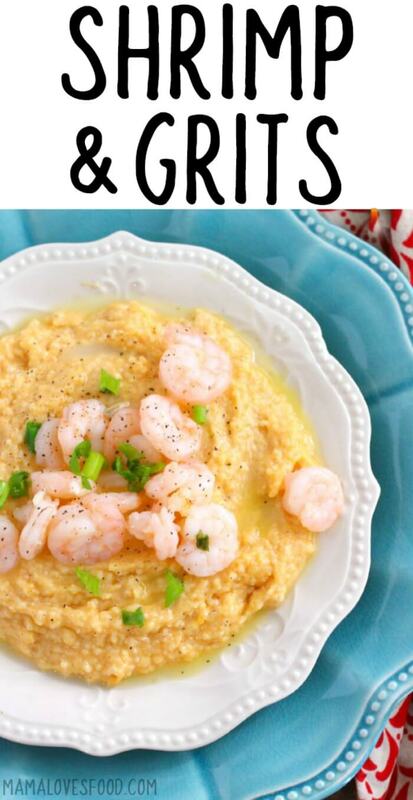 You can use any kind of shrimp or crawfish in shrimp and grits. I tend to buy the large bags of peeled, uncooked shrimp in our grocery store freezer when they go on sale. Shrimp defrosts very quickly, just put it in some cold water a few minutes before you need it then pat dry. I definitely prefer to us pre-peeled and deveined shrimp and when you do, this recipe comes together super fast! If you don’t have the time or inclination to make your own chicken stock for shrimp and grits, store bought works just fine! Using chicken stock in place of water elevates the flavor and makes it so much more rich and robust. It’s easy to make delicious Campbell’s recipes with Swanson Broth giving it an extra boost of flavor. And, I love that Campbell’s new Swanson Broth containers have a measuring strip and a screw cap for simple measuring and easy storage! You can also watch us make shrimp and grits (and key lime pie!) on YouTube! Make sure to tune in for all our live cooking shows! Reduce heat to low and continue stirring until grits thicken. Pour in cream and mix well. 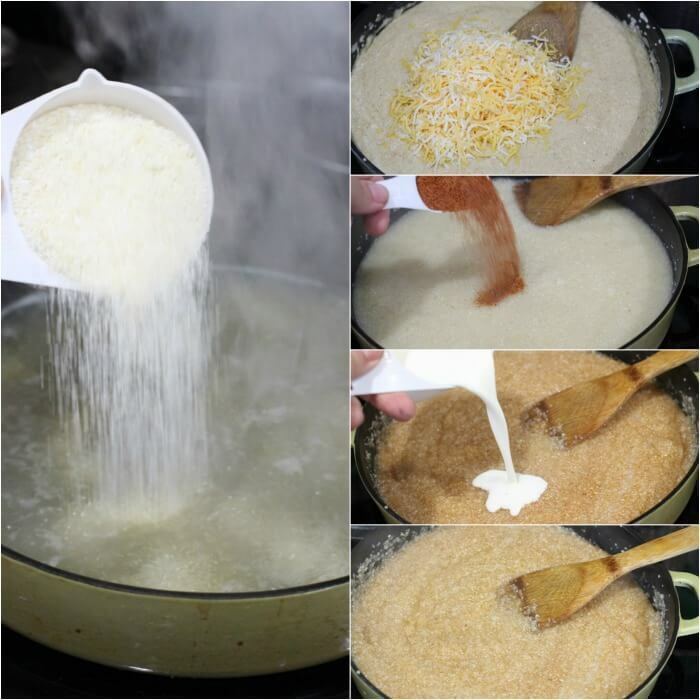 When grits have thickened again and are heated through, stir in cheese. In a large skillet or wok, bring butter and garlic to a simmer. Stir for a minute or two until garlic is fragrant. Toss in shrimp and cook until they are pink and opaque. Do not overcook. Serve over cheesy grits and enjoy! This looks so good. I happen to have everything at home expect chicken stock. Can I use beef stock instead? Thanks!